The theme of Conscious Union with God is: "My conscious union with God constitutes my oneness with all spiritual being and idea." When we reach the place in meditation where we become consciously one with our inner Being, we are automatically one with the entire spiritual universe – the universe of the past, the present, and the future. In developing this theme, Goldsmith reveals that when we have a realization of this principle, whatever is essential to individual unfoldment and fulfillment will appear in the form necessary to meet the need of the moment. Living from this state of consciousness eliminates the ceaseless struggling and striving that characterizes today's society, and brings harmony, joy, peace and fulfillment to our lives. Conscious Union with God presents key points of the Infinite Way teaching about subjects such as states and stages of consciousness, meditation, seeking answers within, opening consciousness to Truth, mysticism, and the function of the mind. 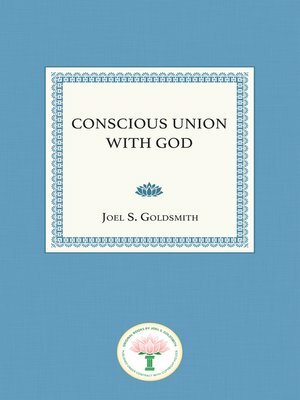 With clarity and deep insight, Goldsmith brings the reader to the awareness that the purpose of conscious union with God "is the unfoldment and revelation of spiritual Being, the harmonious and eternal manifestation of God."